I was born and raised in Miami Florida and spent many family vacations in Key West and often said I would love to live here. After raising five children and being in the restaurant business for 30 years I was offered a position with Margaritaville in Key West. My wife and I sold everything, packed up the dog and off to Key West we went. After two years in Key West, Margaritaville transferred me to Cincinnati to open a new location. We spent a year in Ohio and we knew that our hearts were still in Key West. 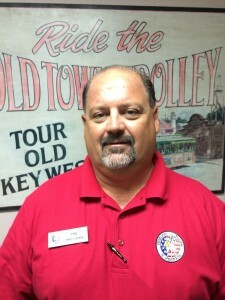 My wife asked me what I wanted to do and I told her I wanted to go back to Key West and drive the Conch Tour Train. She thought I was crazy. Within a month we sold everything again, packed up the dog and came back to Key West. My wife got her old job back, we got our old apartment back, and I landed a job driving the Conch Tour Train! Old Town Trolley CASTmembers at the Veteran’s Luncheon. Each year, on the top of the highest peak along the coastline of San Diego County, the Mt. 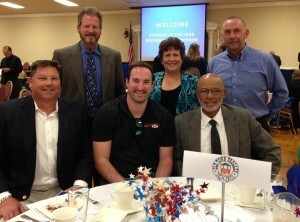 Soledad Veterans Memorial Association pays tribute and honor to our Veterans. This year’s ceremony paid special tribute with a plaque to Prisoners of War and Missing in Action (MIA) Veterans. Old Town Trolley was also recognized for its years of supporting and donating transportation services to local Veterans groups with a special plaque too. The Old Town Trolley plaque included current CASTmembers who are also Veterans. Master of Ceremonies was Marc Bailey, Morning Anchor from CWTV 6. Keynote speakers were Capt. Ernest Moore, USN (Ret) – POW Commemoration and Barbara Brichim – MIA Commemoration. The ceremony ended with a special T-34 performance team flyover. The ceremony honors Veterans by preserving their legacy. Though raised military, I call Pensacola and West Palm Beach, FL, “home.” I previously lived in Tennessee and Nebraska (Go Big Red! ), and have been in Savannah since 2006. Working in hospitality has been an exciting challenge after spending so many years in Healthcare. 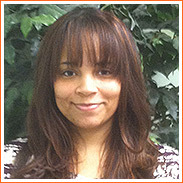 Prior to getting into the HR field in 2008, I was a preschool teacher, and before that a legal assistant. I am a single mother of an absolutely ridiculously fabulous boy who is a daily up-lifter. My perfect weekend would include him, 80s cartoons, Superhero anything, musical theater, museums, and laser tag. A | I’m happiest during my and my son’s weekly board game competitions. A | My grandmother’s sewing machine. 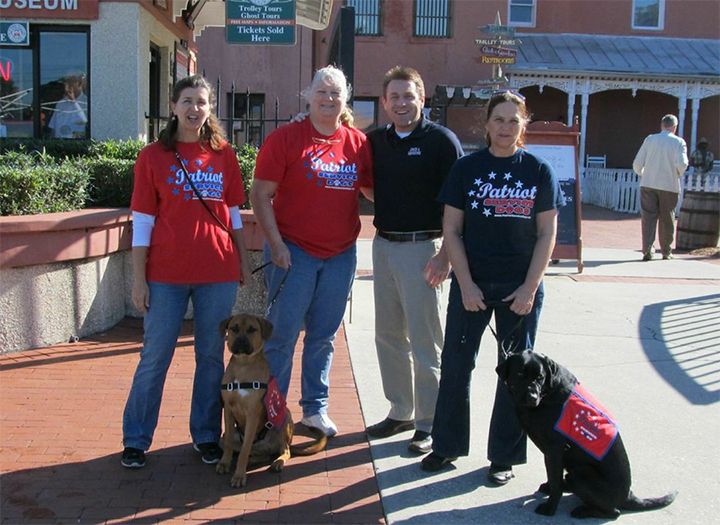 Historic Tours of America is proud to have had the Patriot Service Dogs visit Old Town Trolley, St. Augustine. Patriot Service Dogs, Inc. (PSD) is a non-profit group based in north Florida whose goal is to provide trained Service Dogs to our wounded service men and women with PTSD, mobility disabilities or loss of a limb. This is a 100% volunteer organization. On Nov 11th, Historic Tours of America donated $1.00 from every Trolley Tour ticket price from all six (6) cities to sponsor a puppy with Patriot Service Dogs. Patriot Service Dogs provides veterans with assistance dogs and we are proud to be partnering with them in sponsoring a dog. The Patriot Service Dogs were at The Old Jail at 167 San Marco Avenue on November 11 to help bring awareness of their organization. They have brought with them a few of their service dogs who are currently in training. 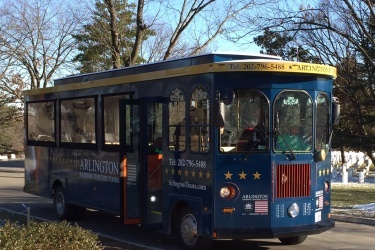 Old Town Trolley Tours of Washington, recently won the bid to provide exclusive interpretive tours for Arlington National Cemetery. This is an extraordinary honor for our company and we look at it as a sacred trust. Arlington National Cemetery sits on the former plantation of Mary Anna Randolph Custis who was the granddaughter of George Washington. She was married to Robert E. Lee and together they lived there until the outbreak of the Civil War. When President Lincoln called Lee to the Blair House and offered him the command of the Union forces, Lee’s response was, “I cannot raise my sword against my fellow Virginians”. He and Mary Anna abandoned the house and moved to Richmond. During the Civil War their home, Arlington House, became a hospital under the former West Point colleague of Lee, Montgomery Meigs. Meigs was so incensed with Lee’s defection to the Confederates that in 1864, when patients in the hospital died, he buried them in the estate garden to insure that Lee could never return to his home. Today, there are over 400,000 men and women buried at Arlington National Cemetery. Three million people a year visit the cemetery and approximately 450,000 take the tours annually. While the notable gravesites in Arlington National Cemetery include the Tomb Of The Unknown Soldier, President John F. Kennedy, Medger Evers, Thurgood Marshall, George C. Marshall, Gus Grissom and military heroes from Abner Doubleday to Admiral “Bull” Halsey, the main sense about Arlington National Cemetery is the 400,000 men and women and their families who gave “the last full measure” to this country so that we could enjoy the freedoms for which the United States of America has become known. Old Town Trolley Tours of Washington raising money for a cure for diabetes. 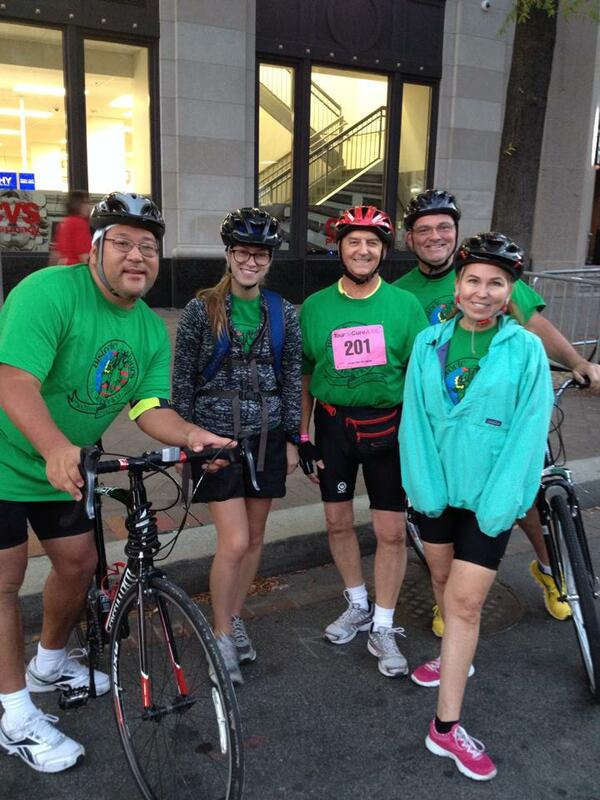 Our amazing team at Old Town Trolley Tours of Washington recently put together a team for Tour de Cour, raising money to find a cure for diabetes. You are currently browsing the Old Town Trolley Tours Blog blog archives for March, 2015.